Teaching kids about coding is an important topic of education in the technology age. But that doesn’t mean teaching programming has to turn your classroom into a boring den of code monkeys! EdBlocks, the super-simple graphical programming language for Edison robots, makes teaching the basics of programming easy. But the magic ‘ah-ha’ moments come through downloading and running the programs with an Edison robot. Seeing coding come to life in this way is what helps kids connect programming to the rest of the world. It’s this real-world connection that really lets your students explore far more than ‘just’ coding (like these other 5 awesome things to do with EdBlocks) and get a truly STEAM experience. Bringing other disciplines and approaches into coding unlocks the potential of computer science for kids, making lessons stickier and more inspiring. Try it for yourself with these 5 STEAM activities using Edison and EdBlocks. Remember when you were little and someone told you the universe was infinite? You would look up at the sky and try to work out just how big ‘infinite’ was by picturing the biggest thing that could ever be, then trying to imagine it even bigger. As kids, having only a limited capacity to extrapolate non-concrete concepts, the idea of infinite is bizarre and a bit unbelievable. It is, quite literally, mind-boggling. EdBlocks lets kids explore the concept of infinity in a tangible way. By using blocks like the ‘loop forever’ block or ‘follow a line forever’ block, students can begin to conceptualise the idea of ‘infinite’ on a timeline. Having students write programs using these blocks gives them a tangible glimps at ‘infinity’ in action. Fair warning: infinity may not end, but eventually Edison’s batteries will! One of the best things about Edison is just how many other things Edison can become (like a crane or a pen plotter using EdCreate or what about making a programmable artists tool). With the right building materials and a good idea, Edison easily converts into the robotic base-block for all sorts of projects. In addition to being loads of fun, using Edison in creative builds can help students better develop their engineering skills and their technological literacy. Building and programming the automatic door project can help open your students’ eyes to the world of possibilities that a bit of creativity, some engineering, and a dash of programming can create. 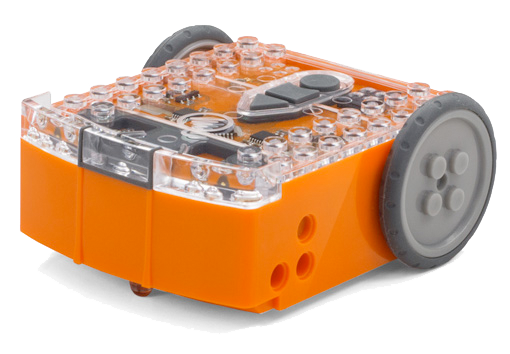 Turn your classroom into a concert hall with Edison robots as the stars. 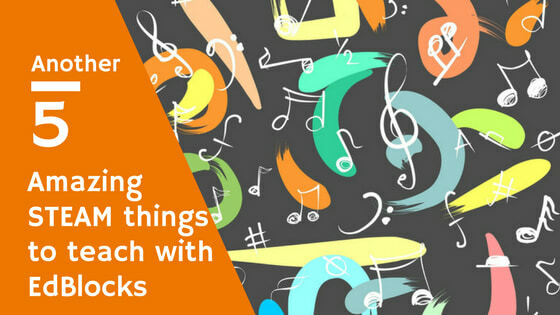 EdBlocks lets students program Edison to play all sorts of music. For this performance, get students to work in groups and have their robots play a song in a round. A round is a musical piece where two or more people, or in this case, robots, play exactly the same melody but stagger when each one starts. The result is a harmonious performance with different parts of the song being played all at the same time. 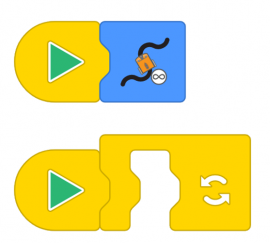 Ask each group of students to choose a song to perform in a round and use time-controlled ‘wait until’ blocks to adjust when each of their robots starts the tune. Once the kids get the timing of their Edison’s just right, make an event of it! Work together to create a stage for the Edisons to perform on, plan the order of performances and even make costumes for the different robots. It’s a moth! It’s a cockroach! It’s … Edison?! While popular culture often represents robots as being gangly humanoids, many robots actually have more animalist characteristics. Exploring the concept of animal behaviours in robotics can help kids learn more about both natural sciences and what robotics are capable of in the real world. A great place to start is with the topic of phototropism: the orientation of a plant or other organism in response to light. Edison can mimic both positive phototropism (moving towards the light) and negative phototropism (moving away from the light) depending on which EdBlocks program you run. Have students experiment programming Edison to act like a moth flying towards a bright light or flee from it like a cockroach. There’s nothing quite as satisfying as watching something come together just right. That’s probably why watching domino patterns fall is so exciting! 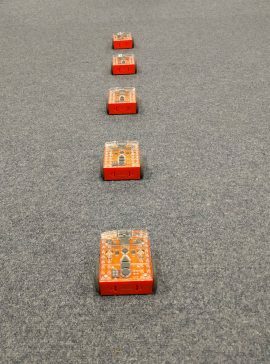 Bring the feeling of anticipation and reward to your classroom (not to mention some sneaky maths) with a giant game of Edison robot dominoes. Have the students work together with multiple Edison robots. Each robot will need to be programmed to drive forward once a single clap is detected. The students will need to work out how much space to put between each robot and how long, in seconds, the robots will need to drive forward. The trick is to queue up the Edison robots one behind the next with no more space between them than the Edison will cover during its ‘drive forward’ block. The kids will have to experiment, measure, and adjust to determine the right distance to cover and the corresponding amount of time to program Edison to drive. Once each robot is programmed to ‘wait until’ a clap is detected, then drive forward the right distance, line up all the Edisons. Have one student tap on the first Edison in the line and watch as it causes a domino effect once it bumps into the Edison in front of it. What awesome things do you teach with EdBlocks? Send us your ideas, pics and videos at social@microbric.com or add them to the online community of Edison awesomeness on Pinterest, Facebook, Twitter, Instagram or YouTube. A version of this article by the same author originally appeared on the Teacher Cast website by permission.